On Saturday I had a super strong 10 miler that really boosted my confidence. Lately my schedule at work has been so jam packed that I started feeling overwhelmed by my workout schedule. You probably already know that since I bang on about it all the time! 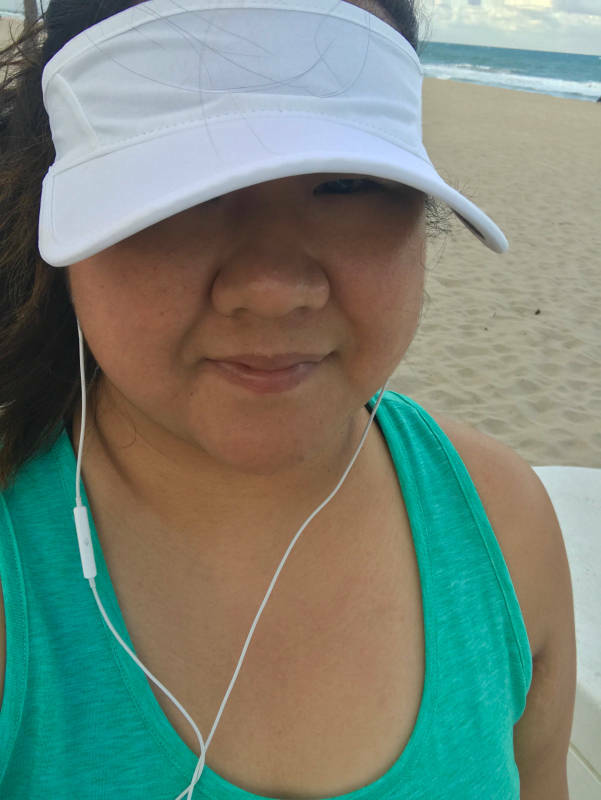 To deal with my anxiety I’ve been taking a “one day at a time” approach to running. Mollie, my coach, and I use Final Surge to track my training progress. Every Sunday she puts in a full week’s worth of training into my calendar in Final Surge, but I’ve stopped looking at the calendar. 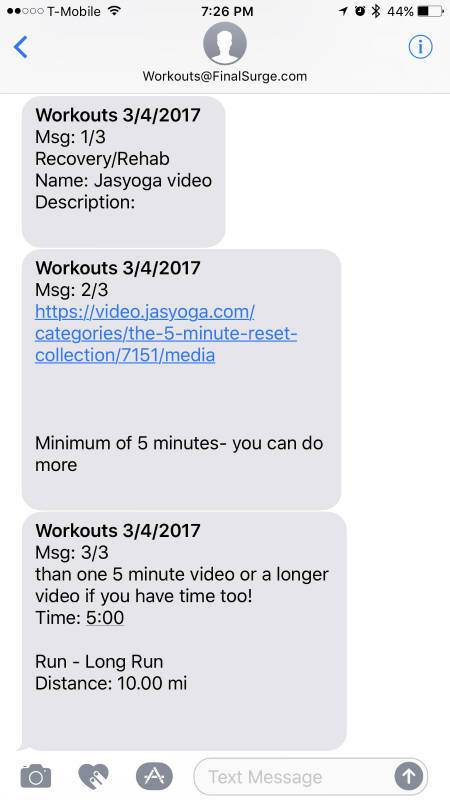 Instead I just have Final Surge text me each day’s workout the morning that its due. 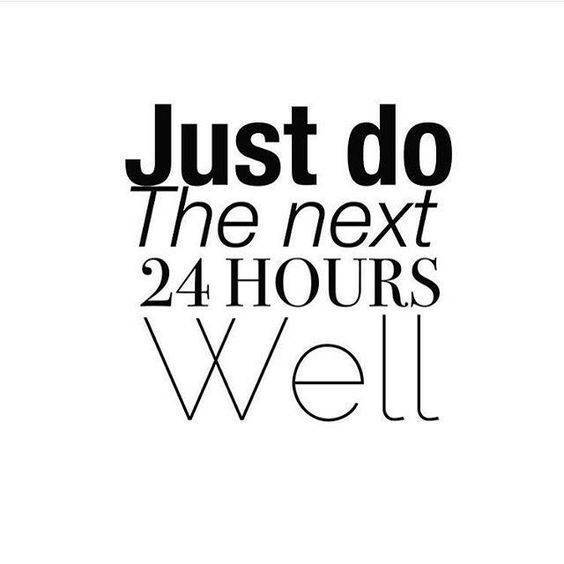 That keeps me in the “one day at a time” mentality. Last weekend I only had eight miles on my schedule for a long run, so what a surprise it was to see a text on Saturday morning saying I had 10 miles due that day. Although I didn’t know what the mileage would be for that day I was anticipating nine miles. Of course, in the grand scheme of things there is very little difference between running 9 or 10 miles, except that 10 miles adds a digit! Since I had not run double digits in a few months it honestly made me nervous to think about. Realistically I knew 10 miles was within my wheelhouse but I still had butterflies in my stomach. It turns out all of that nervous energy was for nothing because I had a great run! In fact the 10 miler completely renewed my love for the long run. It took me a couple of miles to feel warmed up, like it always does, and then I was in runner heaven. Honestly the miles started just clicking off. 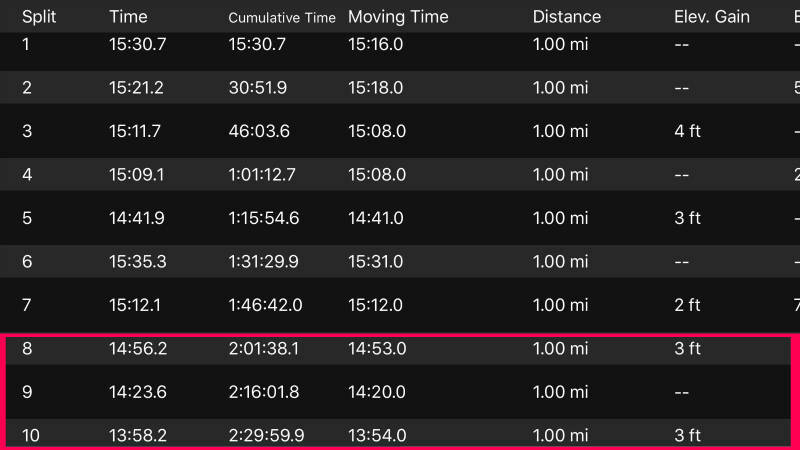 Between miles 5 and 9 every time my Garmin would beep to let me know I’d run another mile I was in shock …. already?! It helped that there were 20 mph winds at my back during that final mile. While running into the wind slowed me down during some of the miles, running with it at my back made me feel like I was soaring. While this wasn’t my best 10 miler ever pace wise (not by a long shot), it was one of the best runs of my life. There have been so many weeks over the last few months that the long run has felt more like a burden than something I do for fun. In fact, recently during long runs I would wonder why in the world I ever wanted to run an ultramarathon. Last night reminded me why running a 50 miler is still on my bucket list. The long run is the best. It’s relaxing and fun and challenging all at the same time. It provides uninterrupted time to daydream, to plan and to work through problems. It gives back to me everything that I want exercise to give me. Adam has asked me before, in the kindest way possible, why I run when I’m not particularly good at it. Why don’t I make lifting my main thing instead when I have some natural talent at that? My answer is always the same: because I want to run. There is no other exercise in the world that has the ability to make me feel the way running does. I’m in love with it. When was the last time you had a running high? Was it suuuuuper windy by you this weekend? We had 22mph winds! Previous Post Running Scavenger Hunt! So glad you had a good long run! I think we need runs like that to remind us how much we love it, especially because not every single run can be great. We had crazy winds at the end of last week. They were so bad that they woke me up in the middle of the night. So glad you had a great run! All of my long runs have been like this the last couple months – which is weird because they are the ONLY runs I’ve been having that boost my confidence, since speed work has been very sparse and my short easy runs have just sucked for some reason. I’ve always been better at distance than short speed, so I guess this shouldn’t surprise me. That’s awesome that all of your long runs have been that way. Sometimes I find myself fighting myself during long runs; either getting bored or thinking about the million other things I could be doing. I think what made last weekend so great was that I just felt so relaxed and in the moment! Congrats on a great run! That is awesome. I always get a running high. Just finishing a workout no matter the distance and I feel great! Susan, you’re so lucky! I do not get a running high all the time, unless you count just being relieved to be done. I always do feel better having gotten in a run and I’m always glad I did it, but I don’t always get that super elated feeling! I wish I was more like you! ROCK ON!!! I’m glad you had one of “those” runs. The kind that feel great and remind us we love running! I had one of those runs this weekend too! It wasn’t the best run of my life but it was a GOOD run when I NEEDED a good run! I had a 10 mile run yesterday too! We actually finished about the same time. My time was 2:29. For the first two miles, I was trying out these new Altra torid shoes that didn’t end up working out for me and so I went back home and changed back into my ghost 9’s. I have a half marathon in two weeks and I’m thinking about whether or not I should push it to 12 miles next Sunday or taper down to 8. I was following a training schedule but then had a knee injury get in the way so I had to take 2 weeks off so now I feel like I’m playing catch up. NICE! We would make good running partners! I would probably taper down to 8 so that I feel nice and refreshed heading into the race. Adding in a few extra miles during one run at this point won’t make much of a difference. You’ve already put in the work to build the foundation for success! Now keep your legs/knees feeling good until rest day! I am glad that you had a good run! A good run always brings back the excitement for running! I like your answer to Adam… sometimes Roger is always telling me how tired he is from running, how painful some of his injuries are, and how much he struggles, but I could never ask him why he runs… I know that he loves it and enjoys the challenge and challenging himself! I get a running high when I run with my friend Adriane, she runs the same pace as me, and she motivates me, I can run up to 8 miles with her and not think about it, but 5 on my own can feel painful. That’s so nice that you have a friend who can do that for you! I’ve never run with anyone else, except for a pace group one time. I ended up breaking away from the pace group after 8 miles because I couldn’t stand the chit chat anymore. I like being alone, haha! The wind is CRAAAAZY down here! I’m going to check on that tool of text messages. I’ll usually go over my week of training every Monday, and sometimes there are runs that really scares me off. I cannot stop thinking about them throughout the week. So this might be helpful. This is such a great post! That feeling of a great long run is seriousy the best feeling ever!! But we have to get ourselves up and out the door to have that good feeling which is hard. I’m with you that I’ll lose confidence if it’s been a little while. I could not wait until the day of a run to know how much I have to do LOL. Kudos to you!! I can completely relate to what you said about your runs feeling like an obligation. I unfortunately feel like that too somedays, especially because a longer run takes up to much of the evening. I would totally be a morning runner if I didn’t already get up at 5am for work! I do feel really accomplished after I finish, though, so I guess it’s worth it in the end. I hear ya! Sometimes when I’m running I’ll just think of the million other things I could/should be doing. The best runs seem to be when I just let myself be in the moment and don’t worry about anything!